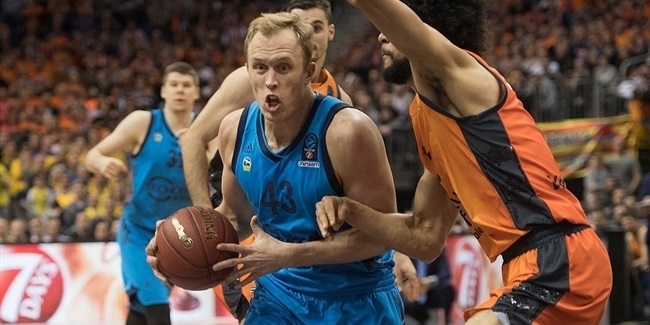 As expected, the last round of the 7DAYS EuroCup brought loads of drama with it, and when the dust settled eight teams - Lokomotiv Kuban Krasnodar, Zenit St. Petersburg, FC Bayern Munich, Unicaja Malaga, Hapoel Bank Yahav Jerusalem, Herbalife Gran Canaria Las Palmas, Valencia Basket and Khimki Moscow Region - were happy to have their quarterfinal tickets. 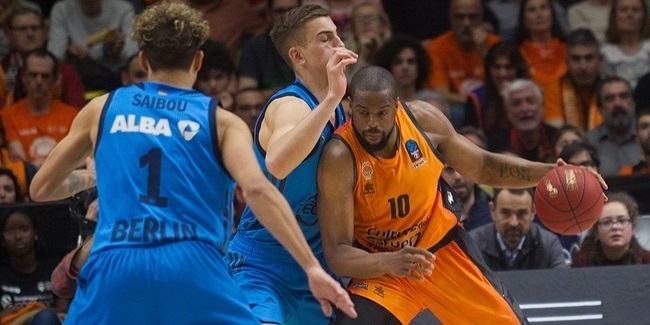 One of those teams, Gran Canaria, only advanced in this very last round led by the individual performance of Royce O'Neale, who was the weekly MVP thanks to his performance index rating of 34, the highest this week. O'Neale led the way for Granca with 19 points in almost perfect shooting - 5 of 7 twos, 2 of 2 threes and 3 of 3 free throws -, 7 rebounds, 6 assists and 3 steals. 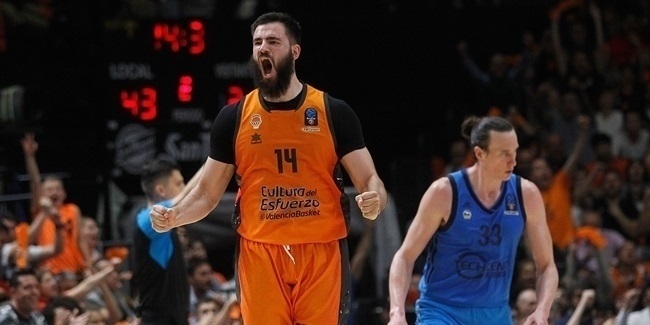 He had personal records in PIR, assists and steals in his second EuroCup season. David Logan of Lietuvos Rytas Vilnius was second in line this week with his PIR of 30 to lead his team to a dramatic win that was not enough to advance to the next phase. Logan scored 28 points, grabbed 3 rebounds, dished 7 assists and had 5 steals. Completing the top individual performances of the week were Maxi Kleber of undefeated FC Bayern Munich (PIR 29) and Sam Van Rossom of also undefeated Valencia Basket (PIR 27). Despite losing big at home, Khimki saw its best man this season, Alexey Shved, lead all scorers this week with his 31 points, just one point shy of tying his all-time scoring mark in the EuroCup. Also, this great scoring night allowed Shved to jump ahead and lead the top scorer ranks (22.5 ppg. in 11 games) of the season, leaving Ryan Toolson of Zenit behind, since the latter could not play this week due to injury. Shved scored almost half of his team's 74 points this week with 6 of 11 two-point shots, 4 of 11 threes and 7 of 10 free throws. Logan followed Shved with his 28 points. Drew Gordon of Rytas put an end to a great season for him on the rebounds department, also leading this week with as many as 12 boards. He has remained consistent since the start of the season and ended up with an average of 9.6 rebounds in 14 games. In the assists category, another familiar face, Zenit's Stefan Markovic, also was the best one this week with his 9 decisive passes, which secured his reign in the league before the playoffs (9.4 apg. in 12 appearances). In the defensive end, two players managed to have 5 steals apiece: Logan and Tony Gaffney of ALBA Berlin. The season champion was UCAM Murcia's Facundo Campazzo with his 2.2 steals per game in 13 games. Finally, Khimki's Sergey Monia had as many as 4 blocks this week to lead the rankings, but it was Rytas' Arturas Gudaitis who was champ before the playoffs with an average 1.9 blocks per night in 9 games in what was a breakout season for him.